While 90 percent of Americans support background checks, and even as the massacres at Virginia Tech and Sandy Hook Elementary School stunned the nation and spurred calls for sensible gun controls, the National Rifle Association spent more than $31.4 million during the 2014 election cycle in a successful drive to stave off reform. On the morning of April 6, 2007, Lori Haas was going about her day as usual, shopping with her church’s minister. Soon, though, she would receive a call that would change her life forever. Her daughter Emily had been shot during a French class at Virginia Tech University. Lori has called her 200-mile drive from her home in Richmond to Blacksburg, Virginia that day “the most horrifying moment of my life.” Although her daughter survived, Lori could not sit idly by while knowing that 32 other families had lost a son or daughter. 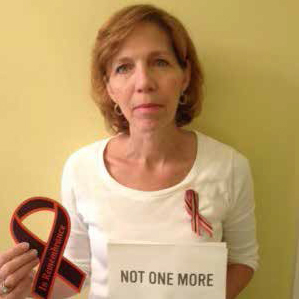 Lori is now the Virginia State Director for the Coalition to Stop Gun Violence, where she promotes awareness of gun violence and lobbies the Virginia General Assembly and Congress to adopt sensible gun laws. Despite the massacres at Virginia Tech and Sandy Hook Elementary School in Connecticut and the outcry to reform our gun laws, the gun industry’s astonishing political spending has helped it secure a stranglehold on politicians at the state and federal levels. The National Rifle Association (NRA) remains the most effective avenue for the gun industry to influence Congress and our elections. Perhaps no organization has more political clout. 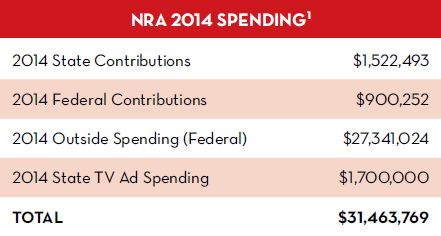 Common Cause estimates that the NRA spent at least $31.4 million on the 2014 midterm elections. Although the NRA has always been a major political force in Congress and in state capitols, its political spending has skyrocketed since the U.S. Supreme Court overturned numerous campaign finance laws and issued the 2010 Citizens United decision. 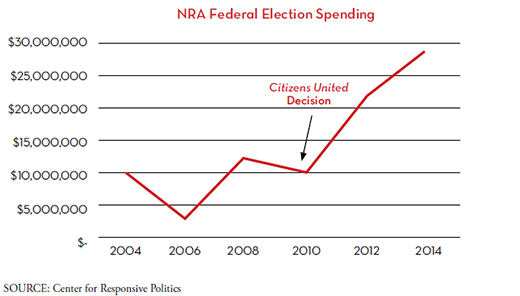 In the 2006 midterm elections, the NRA spent a little more than $3 million on federal elections. Fast forward eight years to 2014 — after Citizens United — and the NRA’s total federal political spending jumped by almost 1,000 percent. In fact, in the 2014 midterms the NRA spent more than it had in the 2012 presidential and congressional elections combined. The NRA increasingly operates through independent political groups rather than direct donations to candidates. In the 2006 midterms, independent expenditures accounted for about 66 percent of the NRA’s total federal political spending. During the 2014 cycle, that number grew to 97 percent. In addition to its electoral spending, the NRA has spent $35 million on federal lobbying since 1998. To protect its ability to spend unlimited amounts in elections, the NRA has taken a strong position against campaign finance reform. Most recently, the NRA lobbied against a proposed constitutional amendment to overturn Citizens United, warning members of Congress that they “will consider votes on this legislation in future candidate evaluations and notify our members accordingly.” In 2010, when Congress considered the DISCLOSE Act, which would require political dark-money nonprofits to disclose their donors, the NRA persuaded Congress to include a provision that would have exempted it from the bill’s requirements. A Senate filibuster ultimately killed the legislation. It should come as no surprise that the NRA has been successful in stopping gun control legislation, including proposals to require background checks on prospective gun buyers at gun shows. Polls show nearly 90 percent of Americans supported background checks, yet the bill died when it failed to get the 60 votes in the Senate needed to overcome a filibuster in 2013. At the same time, the Senate voted down a proposed ban on assault weapons, even when the measure had the support of the majority of Americans. The Sunlight Foundation, a nonpartisan government transparency organization, estimates the NRA’s Political Victory Fund saw a 95 percent return on investment in 2014, with 95 percent of the candidates the NRA funded in the 2014 midterms winning election. However the NRA is not the only political heavyweight advocating against gun control. Hunting organizations such as the Safari Club International and the National Shooting Sports Foundation spent more than $600,000 on political contributions during the 2014 cycle. Other major players include the National Association for Gun Rights and the Gun Owners of America. “The truth is, [NRA leaders] are drunk on money and power,” Lori Haas asserts.